It’s time to take a look at a really old school Japanese horror film. I didn’t really know what to expect with this one, but it’s definitely a little different from what I could have ever guessed. It’s definitely a slow burner so fans of the atmosphere approach could enjoy it, but unfortunately a very weak cast filled with terrible characters holds this one all the way back. It ends up being a bad film instead of a decent one. There are some good ideas here, but ultimately they cannot capitalize on them. The film starts off with a group of sailors trying to sail away from the rest of the world. Each one has a different reason for being on the ship, but ultimately they will be heading to another part of the world where they can really live out their lives. Unfortunately the ship crashes and they all land on a foreign island. They quickly learn that there is more to this island than simple wildlife as the mushrooms are deadly. Left with dwindling resources the characters begin to turn on each other and allow their primal instincts to take over. Can any of the crew survive or at this point have they already lost enough of their humanity for it to not matter anymore? As I mentioned above, the main problem with the film is the fact that the characters are so bad. I understand that the point of the film is about how all of the characters slowly succumb to the situation, but it’s a very negative outlook. The view that all humans will eventually turn evil is a common one, but certainly not an accurate view nor is it a very entertaining one. The characters start to become corrupt almost immediately and the ones who haven’t turned yet aren’t strong enough to defy them. It makes for a pretty mean spirited film where you know everyone is doomed from the start. That’s not a bad thing per say as it can be fun to have everyone bumped off. There are quite a few good retro films with a plot like that which works out pretty well. The reason why this one doesn’t work well is because we don’t have the mystery angle to work with and the characters aren’t written nearly well enough to pull this off. The writing isn’t terrible, but I wouldn’t call it good either. The film ends up dragging on quite a bit despite not being very long which is always a very troubling sign. Then we have the fact that the mushroom people don’t appear much at all. When they finally do show up it’s not as if they are all that impressive in a fight. They aren’t bulletproof or anything like that and are quite slow. The only reason they are even able to put up a basic fight is because the main character, Kenji, isn’t very smart and likes to waste bullets. By the time he is surrounded it is naturally too late as well….or it would be if they weren’t so weak. Kenji manages to overcome 20-1 odds which tells you all you need to know about the mushroom people. From the rest of the crew we have 3 flat out antagonists. One is a girl named Mami who likes having everyone fight over her so she manipulates the men on the crew. That shows how weak willed they are. Ultimately her plan is mainly to call on everyone’s bluff and she still manages to get the last laugh in the end. Then the other two villains like making threats about how they’ll assault the other crew mates. This is the kind of drama that the film goes for and it’s the low hanging fruit on any situation like this. It doesn’t help the film’s writing at all. If anything it just diminishes the experience greatly like here. When nobody challenges the villains initially after the first threat there is no way to regain respect for the characters either. Then you’ve also got the villain with a gun who manages to get the heroes at gunpoint 2-3 times. Did they really think they could be safe after locking him inside when everyone else is crazy? Their food supply is stolen several times as everyone else gets really greedy while on the ship. The only one who stays strong is Kenji and even then he seems rather naïve the whole time. Some of the characters get brief backstories but there isn’t much time to explore them. Aside from the villains who are just plain unlikable, the main heroine may be the worst character here. Akiko is extremely timid and lets everyone walk all over her. She does her best to bring down the mood and atmosphere aboard the ship. Getting seasick is no fun so I won’t blame her for all of that but if she doesn’t get along with everyone then getting on this boat was probably a mistake. Even by the end she ultimately ends up cracking with everyone else. It’s possible that she was forced to eat a mushroom so I won’t be too hard on her, but it doesn’t help her case either. Naturally the heroine who was actually outspoken and ready for action turned out to be evil. Most of the film is a flashback so you already know that at least one guy will get out safely. That does hurt the tension in the scene where villains surround him since you know that he can’t die there or even be transformed. It’s always an odd tactic to have a flashback be most of the film because you already know the ending. It’s just a huge spoiler. Kenji tries to sound deep and moving by the end, but since he’s already mostly crazy you can’t blame the doctors for keeping a safe distance. They are just looking out for themselves after all. Overall, I guess I have to say that the film was a little disappointing. The film’s set up just isn’t all that great. I don’t mind the idea of a group of characters being stuck on an island and trying to survive, but then you’ve at least got to have a great group of characters who have solid banter with each other. It should be the group surviving against monsters or dangerous elements. If most of the group is either evil or unlikable then that’s going to take everything away from its potential. You don’t want to watch a civil war between the islanders, especially not with the stakes this high. If you want to watch a classic Toho film then I highly suggest sticking to Dragon Ball Z or Godzilla. This one’s just too much of a slow burner and ultimately doesn’t manage to keep its quality levels up. 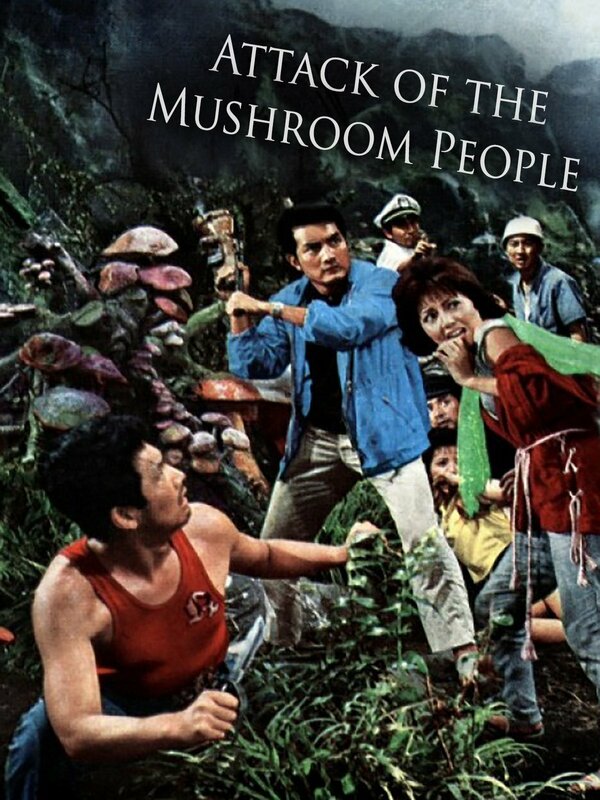 This entry was posted in Live Action Movie Reviews, Live Action Movies, Reviews and tagged Attack of the Mushroom People, Drama, Film Review, Horror, Japanese film, Matango, Movie Review, Review, Suspense, Toho by dreager1. Bookmark the permalink.